Editor's note: We received word that Reggie passed away on Sunday, February 18, three days after we published this article. Our prayers are with her family, friends and all those who loved her. Reggie's gracious presence will be missed. In 1990, with Sr. Dorothea Jurkowski at the helm of the Association of the Holy Family (AHF) in Worcester, MA, Regina Wolanin, or Reggie as she is fondly known, became an Associate of the Holy Family. Now, at 91 years old, after raising three sons and helping with three grandchildren, Reggie believes more than ever that the Sisters of the Holy Family of Nazareth charism is a perfect and inspirational fit for her life. The charism has inspired her family in deeply significant ways. Today, her sons, their wives and her grown grandchildren continue to honor the family life and traditions Reggie taught them. Almost 30 years ago, when Reggie was asked to join the Association, she says she was “delighted” because she was already doing things that were in tune with the CSFN charism. “From the Sisters, I learned about the Holiness in ordinary moments,” Reggie recalls. As a kindergarten teacher at St. Mary’s in Worcester, and as a volunteer with the Ladies’ Guild at Our Lady of Czestochowa Parish, also in Worcester, she experienced many ordinary moments where she had opportunities to share her love and giving spirit with others. Reggie also taught cooking and sewing at the Girls Club in Worcester and, in her 80’s, assisted at St. Mary's school library and offered morning and afternoon programs at the school. When the call came for Associates to become leaders in the group, Reggie was ready to answer the call and went for training in Philadelphia. Though CSFNs are no longer present in Worcester, MA, Reggie, together with other Associates, have continued the Sisters’ mission through regular meetings, retreats and daily living. Reggie led the Worcester AHF group until 2017 when she relinquished the role due to health issues, but she continues to be an active member. “The Association has deepened my prayer life and spirituality,” Reggie said. She fondly recalls when the Worcester AHF collected clothing for Visitation House, a home that provides “safe housing, healthy food and the support of a caring staff” to women with “crisis pregnancies.” The group also collects food for Pernet Family Health Services which offers an emergency food and infant supply pantry in Worcester. 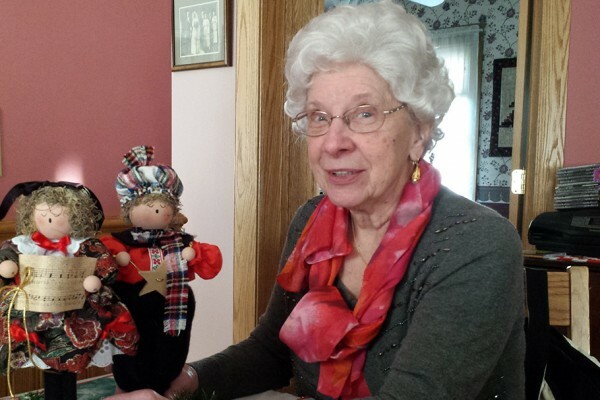 Through the decades, the Association has kept Reggie active in her faith life. “I am so grateful to be able to share my faith with others,” she said. Are you interested in deepening your spirituality as an Associate of the Holy Family? Please click here to learn more.